Unlike most who choose to become Kuni Witch Hunters, Kuni Utagu did not have a particularly traumatic childhood. There was no horrific event that drove him to seek revenge on the creatures of the blighted lands, there was simply his own drive and determination. Utagu was introduced firsthand to the Shadowlands by Kuni Atsutane who explained to him that the Witch Hunter's duty was to face alone the horrors within. Although the Kuni cannot afford to waste time training those who may become unwilling to carry out the Witch Hunter's duties, Utagu was allowed to begin training when he told Atsutane, "I cannot leave now. If I leave, the darkness will have won." During his long career, Utagu became known as The Wall, because the people around him felt as safe as if they were behind the Kaiu Kabe.Utagu made many advances to the practices of the Witch Hunters, including the successful combination of martial arts and Kuni magic. Despite his successes, he never seemed to be driven by a hatred of the Shadowlands, merely a need to destroy everything about those dark lands. Kuni Rashomon is a young and ambitious Witch Hunter who quickly rose in rank after the defeat of several Maho cults and the destruction of a Genzo no Oni.The Genso no Oni was one of the few intelligent oni, able to master some of the most refined combat techniques. Genso no Oni was humanoid in appearance, but it's face was that of a grinning demon. It wore a hakama in mockery of the samurai. In combat Genso no Oni would usually spar with samurai, mocking them, pointing out their faults with gleeful joy, and winning effortlessly. Only the most persistent, strong-willed samurai could hope to kill it, since this Oni was the equivalent of a master at arms. As the son of Kuni Chiuba, who is the head of the Ranpo Temple in the Kuni wastes, Rashomon has always enjoyed privileges and status. 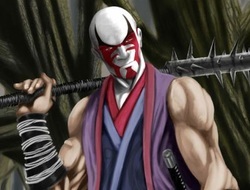 This, and his love of Bishamon, the fortune of Strenght, has led him to train a few years with the Hida Bushi school before joining the Witch Hunters. 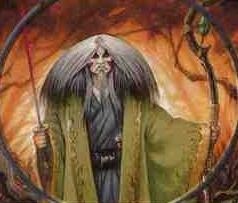 Apart from his various accomplishements, Kuni Rashomon was also charged to lead the Crab Magistrates, who's job it was to clean up Rokugan after the terrible events on the 2nd Day of Thunder and to preserve the Jade supplies. Harudoki is a renown Crane courtier who specialises in dealing with the Crab Clan. The Katogama family is a vassal of the Doji. Officially, the family kept the peace, monitored the land and reports back to the Champion. In fact, they were a spy network answerable only to their family daimyo and the Crane Clan Champion although this knowledge is very secret (obviously). Doji Harudoki is also an air shugenja of considerable power. She was married to Ashahina Tachibana,, a known creator of Talismans. However, Tachibana died during the Clan Wars, when a Shadowlands horde attacked Kyuden Kakita. Doji Harudoki still grieves over the loss of her husband and secretly blames the Crab for not holding back the Shadowlands at this time. However, she remains faithful in her duties and will never allow her personal feelings to interfere with her job. She is also the niece of Toritaka Koiso, wife of the Toritaka Daymio who died during the Shuten Doji attack and the sensei of Doji Hamaki, the secret love of Toritaka Hideyaki. Eisai is a nun of the Brotherhood of Shinsei. Devoted to the study of the Tao of Shinsei, the worship of the kami no michi (the gods and spirits called the Thousand Fortunes) and the pursuit of enlightenment. Her true name is unknown, and the monks of the Shrine of the Seven Thunders renamed as Eisai, which means "prodigy", for her talent with the void element. Eisai took a vow of silence. Her sensei describes it so: "She has chosen not to speak. She had chosen not to age. She sees choices where others see only riddles. Her heart is true, and her spirit sings with a warrior's tongue." As the Clan War grew fiercer, Eisai became more depressed, retreating into herself. A monk claimed to have visited her during one of these episodes, sitting by her for hours as she watched crying a battle between the Lion and Crane a thousand miles away. Sometimes she has visions of the future but refuses to share them with any but her closest friends. She is said to be on Brink of Enlightenment. At the time she first meets the Crab Magistrates, she is pregnant and escaping the purge of the Togashi family. Daimyo of the Dragon Clan, Hitomi forced all of the Togashi family to renounce their loyalty to their family line under pain of death. Some did, while others fled the Dragon lands and joined the Brotherhood of Shinsei. Eisai now travels to Phoenix lands, via Crane lands to find a safe haven for her son to be born. Yes, she knows exactly who her unborn child is and what he will accomplish in his life.